Guardians of the Galaxy. Volume 1, Cosmic Avengers / Writer: Brian Michael Bendis ; Pencilers: Steve Mcniven (#0.1, 1-3) & Sara Pichelli (#2-3). 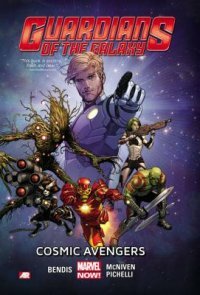 "Contains material originally published in magazine form as Guardians of the galaxy #0.1 and #1-3, and Guardians of the galaxy: tomorrow's Avengers #1." Cosmic Avengers -- Tomorrow's Avengers / writer: Brian Michael Bendis; art: Michael Avon Deming & Rain Berodo (Drax), Ming Doyle & Javier Rodriguez (Rocket Raccoon) and Michael Del Mundo (Gamora & Groot).